Source: Paul Green Bust, Fort Raleigh National Historic Site. Photograph used courtesy of David Walbert under a Creative Commons Attribution-NonCommercial-ShareAlike 2.5 Generic License. The life-size bust depicts the writer and playwright in a contemplative pose, with his head tilted to the side and cast slightly downward and his left hand resting on his cheek. Green is depicted in fairly formal dress, wearing a coat and tie. The bust is mounted on a polished slab of dark marble which rests atop a wooden base approximately four feet high. The plaque, a printed sign bearing the commemoration, is placed in the center of the wooden base. 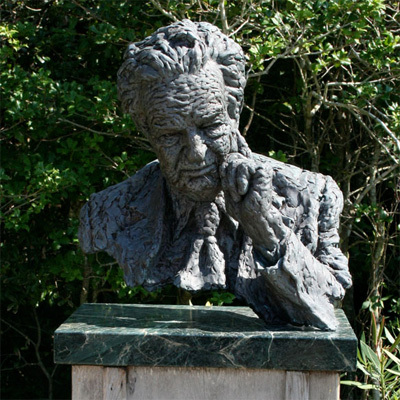 The bust was placed in the gardens sometime following Green's death in 1981. Details of the installation and dedication at Waterside Theatre are unknown. The bust appears to be a casting of the sculpture created by Hipp in the mid- to late 1970s. A casting of the same sculpture is also installed at the University of North Carolina at Chapel Hill Center for Dramatic Art and was unveiled in the Paul Green Theater building at the University on November 18, 1977. The bust was commissioned by the University of North Carolina at Chapel Hill Dialectic and Philanthropic Society, of which Green had been a member as a student at the university. Paul Green, a playwright and native North Carolinian from Buies Creek, North Carolina, was the author of The Lost Colony, the longest running symphonic outdoor drama in the country. It was first performed in Manteo on July 4, 1937. When first staged, it drew crowds of more than 2,000 to what was then the isolated and tiny community of Manteo. The Lost Colony has been, and continues to be, a popular tourist attraction on the Outer Banks. Today the play is performed at the Waterside Theatre at the Fort Raleigh National Historic Site. Green's work is known for both its experimentalism and its focus on depictions of North Carolina and the South, and he is recognized for being among a generation of writers who brought recognition to Southern writing. He won the Pulitzer Prize for his 1927 play In Abraham's Bosom. Green is also known for his commitment to human rights and racial equality. The sculpture sits in the garden just outside the rear of the Waterside Theatre. The sculpture sits in the garden surrounded by plantings.